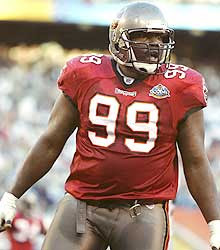 After being chosen by the Buccaneers in the first round (12th overall) of the 1995 NFL draft, Sapp had a disappointing rookie season in which he lost his starting job. However, he improved significantly in his second year, in which he recorded 9 sacks and emerged as a leader on the defensive line and in 1997 he had 10.5 sacks and was chosen to the Pro Bowl for the first time. Fast and disruptive in the middle of the line, he was selected to the Pro Bowl again in ’98. Buccaneers went 11-5 to finish first in the NFC Central and gain the second playoff seed in the conference while leading the NFC in fewest yards allowed (4280), fewest passing yards allowed (2873), and fewest points allowed (235). Won NFC Divisional playoff over Washington Redskins (14-13). Lost NFC Championship to St. Louis Rams (11- 6). Sapp had a career high 16.5 sacks in 2000 and was a consensus first-team All-NFL selection in each of the next three years, from 2000-02, and a Pro Bowl choice after the next four through 2003. The Buccaneers remained a strong defensive team during that stretch that included a Super Bowl title following the ’02 season. While showing signs of wear, Sapp moved on to the Oakland Raiders in 2004 where he had a down year in a different defensive scheme. Improvement in ’05 was overshadowed by a shoulder injury that cost him six games and required surgery. He came back to reach double-digits in sacks one more time with 10 in 2006 and played one more year, retiring following the ’07 season. Overall, Sapp had 96.5 sacks (77 of them with Tampa Bay, making him the franchise career leader), was a consensus first-team All-NFL choice on four occasions, and was chosen to seven Pro Bowls. Sapp was inducted into the Pro Football Hall of Fame, Class of 2013.